If an astrologer told me in 2004 when I was leaving India, with the sole purpose of experiencing anonymity after a lifetime of notoriety gained as a trans woman, that I would be spending most of my life talking about migrant women’s rights, or rather their lack of, I probably would have never left India. But, I did, and here I am talking about migrant women’s rights, as though nothing else matters to me. Because it is true, immigration control and its gift to women – “No Recourse to Public Funds” – has never left me. Its ugly shadow has forever blighted my Scottish existence, letting me know in the most unexpected of places that I and those of my kind are not valid, valuable, or worthy of the rights and privileges that other Scottish citizens take for granted: the right to safety, family, welfare, peace. Everything that we would expect from a place we call home. I remember the first time that this concept of No Recourse to Public Funds hit me in the face, during my first few weeks at Shakti Women’s Aid. Until then, in my privilege of being a well-funded Master’s student, I didn’t think that there was a disparity in the rights that UK residents had. As a naïve, young worker, I had walked into this organisation thinking that, of course, there would be fairness and access to safety for women who had the privilege of living in a society where an organisation like Women’s Aid exists. I didn’t know then of the struggles of my fellow feminists to ensure that violence against women and girls was responded to with the seriousness it deserves. But what do we mean by “No Recourse to Public Funds” (NRPF)? In simple terms, it is a status afforded to those who are subject to immigration control that prohibits them from accessing benefits that are deemed as public funds, including in-work benefits and council-provided housing. It is almost always religiously applied to non-EU migrants to the UK, and, usually, they have their status till they leave the country or are able to gain Indefinite Leave to Remain. Many think that this is fair. Why should people who have recently migrated have access to social housing and welfare when they haven’t contributed enough? That question, however, ignores the fundamental fact that the welfare system is largely a safety net to help people in crisis. So, why is it that migrants living in the UK, when faced with a crisis, are not afforded the same rights? The question always asked of a woman who is seeking help from the state and its actors is: “Why can’t you go back to where you came from?” As though migration is a vacation. Women migrate for the same reasons that men migrate, and migration isn’t a cure to the inequalities that women might experience in their home societies – if anything, it makes it worse. We cannot underestimate the impact of having to build a support network in a racist society that has decided, even before you arrive, that you are not wanted. NRPF stamped on your passport is the destructive symbol of a racist state policy. Can you imagine the plight of a Women’s Aid worker who, when confronted with a woman demanding safety, is forced to refuse her refuge, not because there is no space, but because she isn’t entitled to the housing benefit that will pay for the refuge space? If you can do that, now imagine the plight of the woman being refused. She is being told that she is not entitled to receive the benefit of the investments that we are making as a society in ending violence against women and girls. I always wonder, would women have allowed such a policy to be developed and enforced so cruelly on other women? I am not convinced that my answer would be no. 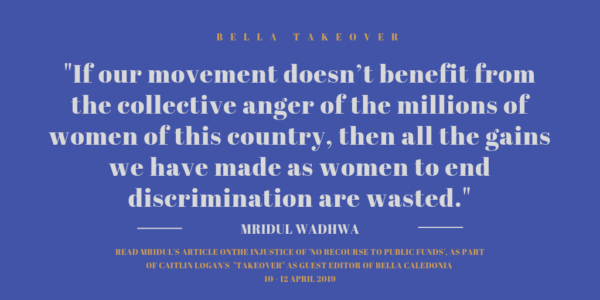 For many years, women activists like me and my colleagues, and other Black and Minority Ethnic (BME) and migrant women before me, have been out in the wild, trying to convince our white feminist sisters that this is a cause that needs their weight too. I don’t only speak of the women involved in the Violence Against Women sector, but of the masses of white feminist women who have got together to create such phenomenal social change in this country. Rarely have we seen a mass shout-out to end NRPF as we see in our successful and ongoing campaigns to tackle period poverty, equal pay, and so many other issues that create a deficit in the lives of women and girls in Scotland. Migrant women have been left out in the cold to fight a racist state on their own and under the radar. While we are doing that, women with NRPF are dying, forced to remain in abusive situations, and more importantly, “Othered”, depriving us, as a society, of the valuable contributions that they could make to it. What’s more, our numbers are swelling, as the nasty web of those who have No Recourse to Public funds grows bigger. These days, even women from the EU are experiencing restrictions to when and how they can access the welfare state, and this was even before the referendum to leave the EU. The reality is that for any lasting and positive change to happen, we need to mainstream the campaign on No Recourse to Public Funds. I support the fact that migrant women should lead the movement to end the oppression we face. We already are. But the question is, who are we leading? For it is not the leader alone who makes the change, it is the movement. 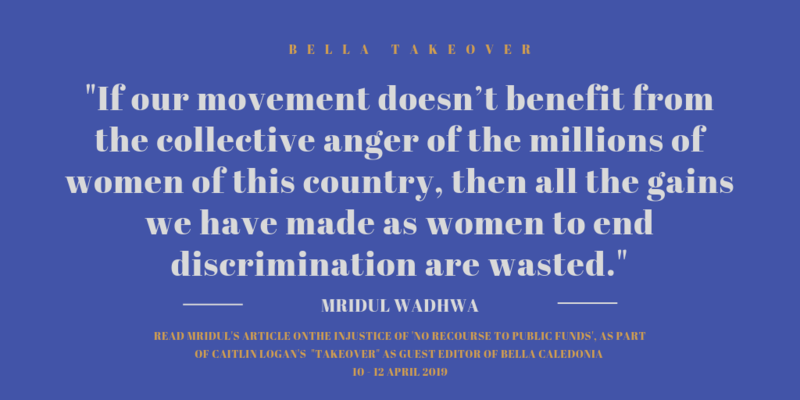 If our movement to end No Recourse to Public Funds doesn’t benefit from the collective anger of the millions of women of this country, then all the gains we have made as women to end discrimination are wasted. Please always seek immigration advice if you have doubts about your immigration status and right to welfare. @lordmac (1) What has that got to do with it? Common decency is common decency, and human rights are human rights, and all countries not upholding them should be condemned. (2) You cannot ‘favour’ anyone for equality. Equality is equality. (3) Do your own research regarding which countries offer benefits to immigrants. Why should anyone do this for you? (4) While you are doing your research, how about looking into the horrific things done by the wealthiest countries which (often via the transnationals founded and headquartered in them) destroy lives the world over and caused desperate people to flee their homes? I suggest you investigate human-trafficking, the arms industry, the expropriation of land for agro-industry to grow commodity crops, the ravages of extractive industries, the global network of tax havens (Canary Islands, British Virgin Islands, Channel Islands, Panama…) allowing ill-gotten gains to be siphoned out of the world’s poorest countries, the whole deplorable history of colonial exploitation, pillage and divide-and-rule tactics and, not least, climate change which, per head of population, is overwhelmingly the fault of wealthy countries, but which so far has largely impacted on countries elsewhere (including Syria, by the way). Also look into how so-called ‘aid’ is often anything but – it’s often a tool of neo-colonialism. (5) Report back when you have done your research. Your comment (1) should be everyone’s motto, RES. Every person should be entitled to compassion wherever s/he happens to have been born & raised. This means, at the very least, being provided with decent food, comfortable shelter & a reasonable standard of living. These should be provided as quickly & humanely as possible and without the need to jump through bureaucratic hoops. Constantly amazed, and disappointed, by people who think that an accident of birth makes people more/less entitled to basic human rights. How should Bella Caledonia readers be supporting the No Recourse to Public Funds campaign?